The Cape-Sleeved Jacket is a top-down jacket, stitched from neckline to hem. It’s stitched in one piece, adding the sleeves directly. There is no seaming. 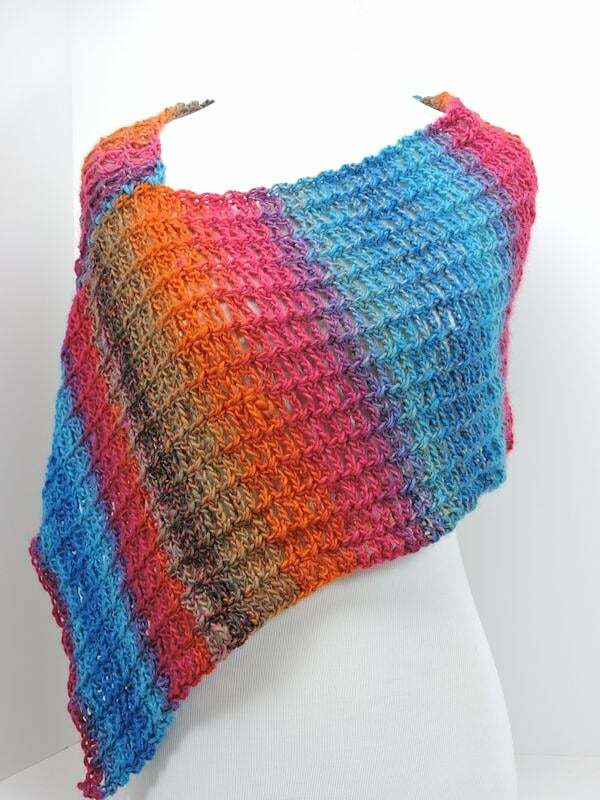 This design is made in linked stitches throughout. Row 1 (RS): Sk first ch, sc in next 4 ch, 2 sc in next ch; repeat from to last 4 ch, sc in each of 3 ch, 2 sc in last ch, turn-83 (89, 95, 101, 107) sc. Round 2 of the trim (the reverse single crochet round) is worked into the front loop only. Then, when you get to round 3, it is worked in the unused back loop of round 1. WARNING: There are 3 videos on YouTube demo-ing this design. While I appreciate the enormous commitment the person has placed in my design, incorrect instructions are given in the videos. While you can certainly review the videos and I’m sure you’ll gain some answers to your questions, you should understand that they are incorrect. In addition to other mistakes, the demo of the linked stitch is incorrect. And, this wouldn’t be a huge issue. But, the demo is using Super Saver, at least a 2 size difference from the yarn used in the pattern. The videos would take me about 1-1/2 hours to review in depth. So, I gave up watching them in their entirety. Swatch must be wet-blocked; in stitch pattern with larger hook, 14 sts and 14.5 rows measure 4” square. To decrease at the beginning of a row, skip the first stitch and work the stitch as indicated in the next stitch. To decrease at the end of a row, work to the last 2 stitches, skip the next stitch and work the stitch as indicated in the last stitch. 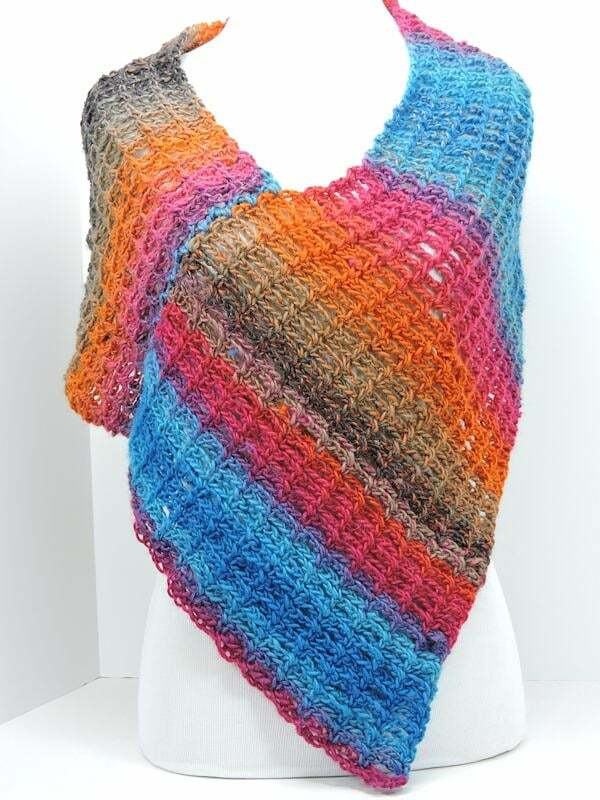 When shaping armholes and neckline, it is necessary to maintain established stitch pattern which means to adjust Stitch Pattern as necessary to ensure that Long Single Crochet are stacked in the same manner as previously worked. If working in only one loop on the last stitch of the row causes stretching at the edge, work the last stitch into both loops. When the pattern indicates an “x” in the stitch count, that row is not worked for that size. Many women have told me that they would like to make this for themselves. Please remember that a woman’s shoulder-to-shoulder measurement is smaller than a man’s. 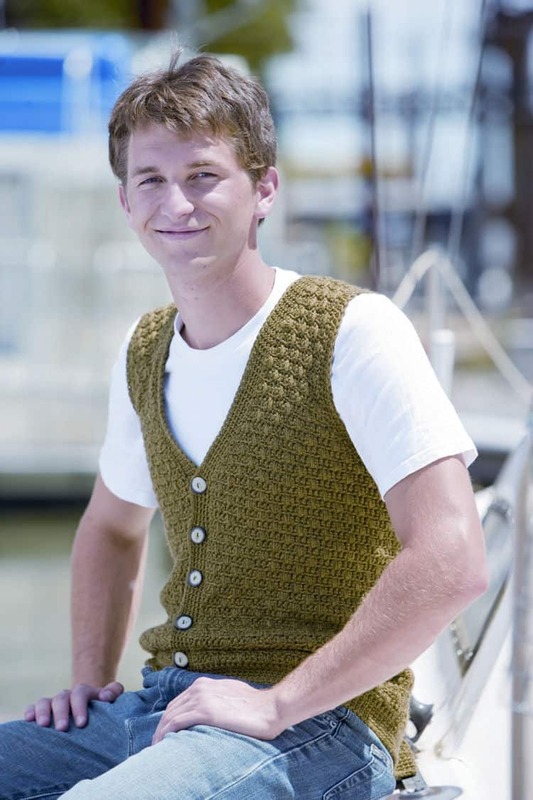 You will need to decrease when doing the armhole shaping or the vest will stick out from your shoulder. Front Loop Single Crochet (FLsc): Work sc in the front loop only of the stitch, as it faces you. Long Single Crochet (Lsc): Insert hook from front of work to the back in corresponding single crochet 2 rows below the working row, yarn over, draw up loop even with the working row (to prevent buckling of fabric), yarn over, draw through 2 loops on hook. Stitch Patterns See pattern Instructions (below) for chain count. Row 1: Ch 1, sc in 2nd ch from hook and in each rem ch, turn. Rows 2-3: Ch 1, FLsc across, turn. Row 4 (RS): Ch 1,*FLsc in each of next 3 sc, Lsc, rep from * to last 3 sc, FLsc in each of last 3 sc, turn. Row 5: Ch 1, FLsc across, turn. Row 6: Ch 1, FLsc in first sc, *Lsc, FLsc in each of next 3 sc, rep from * to last 2 sc, Lsc, FLsc in last sc, turn. Row 7: Ch 1, FLsc across, turn. Rep rows 4-7 for pat. Row 4 (RS): Ch 1, *FLsc in each of next 3 sc, Lsc, rep from * to last sc, FLsc in last sc, turn. Row 6: Ch 1, FLsc in first sc, *Lsc, FLsc in each of next 3 sc, rep from *across, turn. Row 1: With larger hook, ch 68 (74, 82, 88, 96, 102), sc in 2nd ch from hook and in each rem ch, turn—67 (73, 81, 87, 95, 101) sc. Working in SPI (II, II, I, I, II) (see page 2), beg with row 2, work 50 (52, 58, 60, 64, 68) rows. Next row (WS): Sl st across 7 (7, 10, 10, 12, 12) sts, ch 1, maintaining established st pat here and throughout, work across, 53 (59, 61, 67, 71, 77) sc only, turn, leaving rem sc unworked. Next row: Ch 1, dec at beg and end of row (see Pattern Notes), work across, turn—51 (57, 59, 65, 69, 75) sc. Rep prev row 3 (4, 4, 6, 7, 9) times more—45 (49, 51, 53, 55, 57) sc. Without dec, cont until 87 (91, 95, 99, 103, 109) rows completed from Hem. Next row (RS): Ch 1, work across 6 (7, 8, 8, 9, 9) sc only, turn, leaving rem sc unworked. Next row: Ch 1, work across, turn. Row 3: Rep row 2. Fasten off. Next row (RS): After row 87 (91, 95, 99, 103, 109), sk 33 (35, 35, 37, 37, 39) sc, join yarn with sl st in next sc, ch 1, work across rem 6 (7, 8, 8, 9, 9) sc, turn. Rep as for first Shoulder. Row 1: With larger hook, ch 32 (36, 40, 44, 46, 50), sc in 2nd ch from hook and in each rem ch, turn—31 (35, 39, 43, 45, 49) sc. Working in SPI (I, I, I, II, II), beg with row 2, work 48 (50, 52, 56, 58, 62) rows. Next row (WS): Ch 1, working dec at end of row (mark as neck edge) and maintaining st pat here and throughout, work across, turn—30 (34, 38, 42, 44, 48) sc. Rep prev 2 rows 0 (0, 2, 1, 2, 2) times more—30 (34, 36, 41, 42, 46) sc. Next row (WS): Sl st across 7 (7, 10, 10, 12, 12) sts, ch 1, working dec at neck edge, work across, turn—22 (26, 25, 30, 29, 33) sc. Next row: Ch 1, working dec at armhole edge, work across, turn—21 (25, 24, 29, 28, 32) sc. Next row: Ch 1, dec at beg and end of row, work across, turn—19 (23, 22, 27, 26, 30) sc. Rep prev 2 rows 2 (2, 2, 3, 4, 5) times more—13 (17, 16, 18, 14, 15) sc. Work following row 0 (1, 0, 1, 1, 1) time: Ch 1, sc across, turn—x (17, x, 18, 14, 15) sc. Work following row 0 (1, 0, 1, 1, 1) time: Ch 1, working dec at neck edge, work across, turn—x (16, x, 17, 13, 14) sc. Rep prev 2 rows 0 (3, 0, 3, 0, 0) times—x (13, x, 14, x, x) sc. Next 3 (3, 3, 3, 5, 5) rows: Ch 1, work across, turn—13 (13, 16, 14, 13, 14) sc. Next row: Ch 1, working dec at neck edge, work across, turn—12 (12, 15, 13, 12, 13) sc. Rep prev 4 (4, 4, 4, 6, 6) rows 6 (5, 7, 5, 3, 4) times—6 (7, 8, 8, 9, 9) sc. Without dec, work 5 (3, 1, 1, 5, 1) rows more. Fasten off. Work 48 (50, 52, 56, 58, 62) rows as for First Front. Next row (WS): Ch 1, working dec at beg of row (mark as neck edge) and maintaining st pat here and throughout, work across, turn—30 (34, 38, 42, 44, 48) sc. Next row (WS): Ch 1, working dec at neck edge, work across 22 (26, 25, 30, 29, 33) sc, turn, leaving rem sc unworked, turn—22 (26, 25, 30, 29, 33) sc. Cont as for First Front. With yarn needle and WS facing, seam shoulders and sides. Rnd 1: With smaller hook and RS facing, join yarn at either shoulder seam with sl st, ch 1, sc evenly around neckline, fronts and bottom, with 2 sc at each corner, sl st to first sc. Rnd 2: Ch 1, sc in each sc around, with 2 sc at each corner, sl st to first sc. Rnd 3: With stitch markers or small pieces of yarn, mark 5 evenly-spaced button holes on Left Front (Right Front for women). Rep rnd 2, except at buttonhole positions, [ch 2, sk 3 sc]. 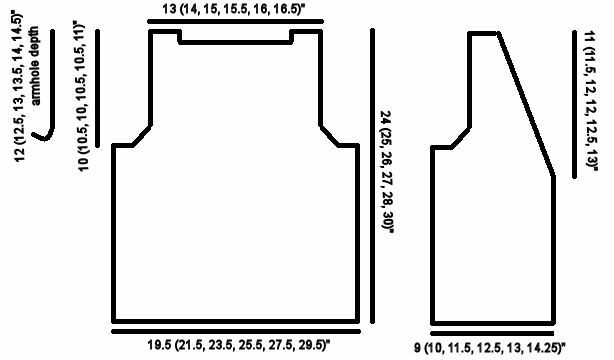 Rnd 4: Rep rnd 2, except at buttonhole positions, work 3 sc in each ch-2 sp of buttonhole. Rnd 5: Rep rnd 2. Fasten off. Rnd 1: With smaller hook and RS facing, join yarn at bottom of armhole with sl st, ch 1, sc evenly around armhole, sl st to first sc. Rnd 2: Ch 1, sc in each sc around, sl st to first sc. Rnd 3: Rep rnd 2. Fasten off. Immerse garment completely in cool water. Gently squeeze out water. Roll in dry towel to remove excess water. Lie garment flat and shape as it will be worn. Allow to dry completely. Sew on buttons adjacent to buttonholes. Weave in all ends carefully. Flat measurements after blocking. Armhole height will increase slightly when worn. In stitch pattern, 17 sts for 12 rows measures 4″. Project is made in one piece. Super easy! This is one of those projects where you let the yarn do the work for you. 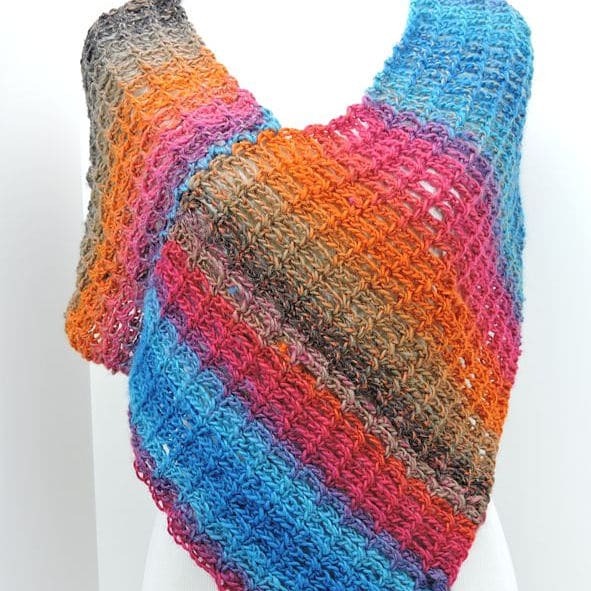 It’s a combination of fabulous yarn and a crazy easy stitch pattern. Row 1: Ch 54 (62), sc in second ch from hook, *ch 3, sk 3 ch, sc in next ch, rep from * across, turn: 13 (15) ch-3 sps. Row 2: Ch 1, sc in first sc, *ch 3, sk ch-3 sp, sc in next sc, rep from * across, turn: 13 (15) ch-3 sps. Rows 3-118 (130): Rep row 2, fasten off leaving an 18″ tail after final row. At fasten off, measure down the side of the rows to 12″ (14″). With yarn needle, seam the bottom of row 1 to the marked length of the 12″ (14″) section along sides of rows. Confession: I didn’t actually seam this project because I try to avoid seaming when I can. If you hate seaming as much as I do, try this way instead. It makes a seam with a bit of lace, which is just fine since the entire project is made of lace. At the point of seaming, join yarn with sl st, *ch 1, sl st to other side, ch 1, sl st to other side, rep from * across position of seam.